The name chakkara pongali itself sounds so yummy. When it is savored hot hot, hmmm!, the taste takes you to a different world. Well, sweet pongal is mostly offered as naivedyam in almost all the South Indian Vishnu temples, specifically in Dhanur Maasam. The taste of chakkara pongali offered to the devotees of Lord Venkateswara Swamy of Tirumala in the free prasadam counter is beyond description. 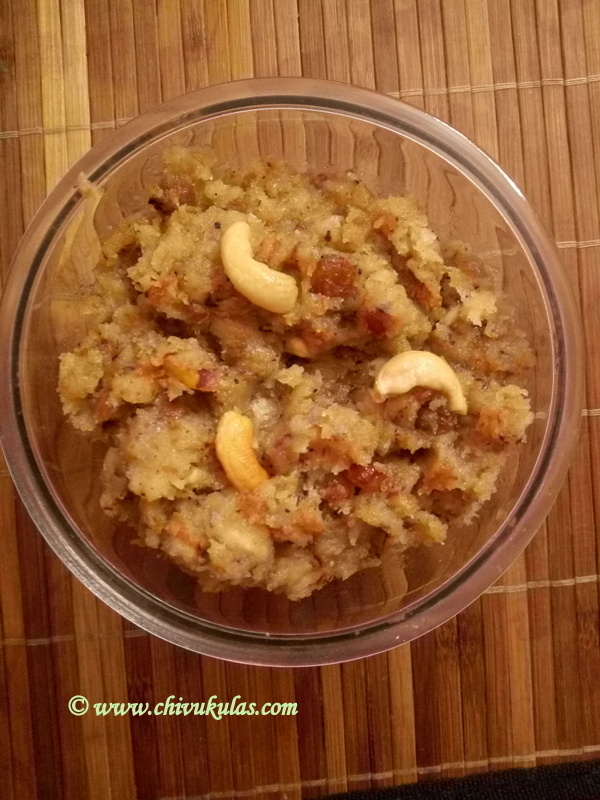 Sweet pongal can be easily prepared at home. I often prepare this during special poojas and offer as naivedyam. But you don't get the typical temple taste at home. I think, the divinely touch / atmosphere in South Indian temples makes chakkara pongali tastier, particularly the sweet pongal in Tirumala temple. Here is how you can prepare it in a simple way. 1 measure of rice. Normally we use ordinary rice but even basmati rice would be fine. I tried with basmati rice and it was really tasty. Three fourth measure of skinless split green gram i.e moong daal. 1 measure of jaggery. You can even take half sugar and half jaggery if you don't like the jaggery taste. Enough ghee. For added flavor, you can use more ghee. Food color (optional). Normally, I don't use food color as it is not a healthy practice. Other dry fruits like sliced almonds (badam) or pista (optional). You can add these for additional taste but not compulsory. 1 cup milk (optional). Usually, I don't prefer using milk for chakara pongali as it spoils fast. I prefer doing chakkara pongali without milk. Wash rice and daal in clean water and pressure cook as usual. You can even follow the traditional way of cooking i.e without pressure cooker. But that's a bit tiresome process as you need to keep continuously stirring. After it is done, take out the container from the cooker, add jaggery / sugar and stir it well. Keep it over low flame till the jaggery / sugar becomes syrupy and thickens a bit. Add food color, elaichi powder and stir it well and turn off the flame. Fry cashew nuts and raisins in ghee and add these to the sweet pongal. Take it into a separate bowl and add other dry fruits if any. Offer this as naivedyam to the Lord.